Endocrinology is the study of hormones and the endocrine system. The study found endothelial dysfunction associated with endocrinopathic laminitis but noted that this dysfunction could be a cause or a consequence of disease. Systemic hypertension seen in obese humans with Metabolic Syndrome and Insulin Resistance "is partly due to a vascular endothelial dysfunction with a decreased production of the vasodilator nitric oxide and an enhanced endothlin (ET-1) mediated vasoconstriction." Plasma ET-1 concentrations were measured with a commercial ELISA-kit (Endothelin (1-21) enzyme immunoassy, Biomedica Medizinprodukte GmbH & Co KG, Wien). Intra-assay CV for plasma ET-1 was 6.7%. One Icelandic horse had ET-1 concentrations of 16.41 pg/ml and 14.59 pg/ml - these were considered unreasonably high and excluded. Another Icelandic horse had ET-1 concentrations of 3.09 pg/ml and 14.59 pg/ml - the variation was considered too great and these results were excluded. One of the above Icelandic horses had ET-1 concentrations above the detection limit 12 hours after transportation - these results were excluded. Mean plasma ET-1 concentration was significantly higher at least 12 hours after being transported for 1 hour to a new stable (compared to home) - likely due to a stress reaction. Blood pressure was not affected. Different ELISA assays for ET-1 may cause discrepancies between results. The concentrations of ET-1 in this study were higher for both Icelandic horses and Standardbreds than those for healthy TBs and Standardbreds in previous research, and similar to those reported for horses with RAO and endotoxaemia. ET-1 showed an acceptable interday variation. Icelandic horses had significantly higher mean plasma ET-1 concentrations than Standardbred horses. There was considerable individual variation in plasma ET-1 concentrations in both breeds, and greater in the Icelandic horses. The difference between breeds could be related to genetic or management differences. "Previous studies in ponies and Icelandic horses have reported that they are partially insulin resistant compared to normal horses [21-23]. Insulin is known to stimulate the production of nitric oxide as well as the production of ET-1 in endothelial cells [24-26]. In the healthy state there is a balance between the insulin stimulated release of NO and ET-1 from the endothelium. In individuals with IR or hyperinsulinemia the production of nitric oxide is decreased but the stimulatory effect of insulin in ET-1 is preserved leading to vasoconstriction and hypertension . This could also explain the higher ET-1 values seen in the Icelandic horses compared to the Standardbred horses, as elevated insulin levels could cause an increase in ET-1 concentration . The higher plasma ET-1 levels seen in the Icelandic horses in the present study did not cause an elevation of the systemic blood pressure." Do endotoxins cause or contribute to laminitis? Lipopolysaccharide (LPS), an endotoxin, is a major component of gram negative bacteria. Researchers have not been able to induce laminitis by administering endotoxins. "Absorption of endotoxin (lipopolysaccharide; LPS) into the plasma has been observed in one experimental model of laminitis, but does not cause laminitis when administered alone. Thus, the potential role of endotoxin is unclear. Platelet activation has previously been demonstrated in the developmental stage of laminitis. ""These data indicate that small quantities of endotoxin may move into the circulation from the large intestine after the sharp decrease in pH that occurs as a result of carbohydrate fermentation. Correlating these findings with in vitro studies suggests that LPS may primarily activate platelets, leading indirectly to the activation of leukocytes. Therefore, endotoxin may contribute in the initiation of the early inflammatory changes observed in experimental models of acute laminitis." Broken incisors, “laid over” teeth, loose front teeth, and gingivitis may be signs of newly recognized disease Equine Odontoclastic Tooth Resorption and Hypercementosis or EOTRH. The cause of EOTRH is still unknown but there is some suggestion that horses with PPID and/or EMS may be at greater risk of developing EOTRH. Associated Risk Factors of Equine Odontoclastic Tooth Resorption and Hypercementosis - Ann Pearson DVM - AAEP 2013 - preview (FOC) and presentation ($10). "Abstract : We suspect that a painful disease involving the equine incisors and canines called equine odontoclastic tooth resorption and hypercementosis (EOTRH) does not have a single determinant but rather occurs as the result of the cumulative impact of several risk factors: trauma caused by excessive dentistry, periodontal disease, type of feed, genetics and hormonal conditions such as equine Cushing's disease (pituitary pars intermedia dysfunction; PPID) and equine metabolic syndrome, and the presence of laminitis." A survey of 233 horses and ponies owned by Pony Club members in Victoria, Australia found that 15% (35/233) had had laminitis, and of these, more than half had had more than one episode of laminitis. 31 of the 35 laminitics were ponies (21.8% of 142 ponies in the survey), and 4 of the 35 were horses (4.4% of 91 horses in the survey). Longland and Byrd 2006 suggested that the incidence of laminitis in the USA is 2% and increases to 5% in the spring and summer. which reported the findings of interviews across 28 US states applying to between 24,163 and 28,026 horses and foals (no ponies, miniatures, donkeys or mules) in spring, summer and winter 1998-99, and found an incidence of 2.1%. of laminitis in the previous 12 months. More horse operators (with 3 or more horses) reported cases of laminitis on the day of the interview in spring (20 Apr-12 Jun - 4.9% of operators) and summer (15 Jun-11 Sep - 4.5% of operators) than in winter (02 Nov-26 Feb - 1.8% of operators), but less than 1% of horses had laminitis on any of the 3 interview days. Dr Al Kane confirmed that "Although 5% of operations may have reported having at least one case of laminitis that doesn't mean that the incidence among horses was 5% during that same time period." (personal message). Of the most recent cases of laminitis described, grazing lush pasture was suggested as the cause of 45.6%, feed problems/injury/obesity/pregnancy were suggested as the cause of 26.9% and grain overload/colic/diarrhoea and retained placenta suggested as the cause of less than 15%. Laminitis 15.6% (17 horses). 13 (11.9% of 109) of the 17 horses had laminitis alongside other conditions given for the reason for death. 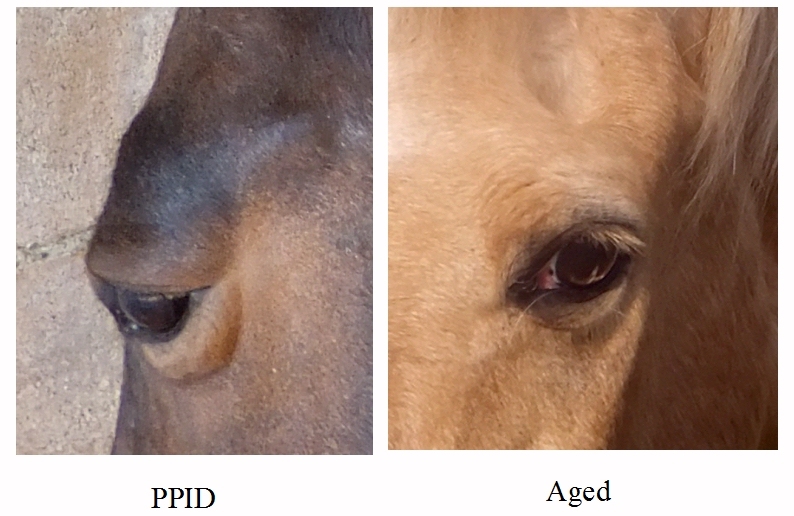 For 19.3% (21 horses), age related deterioration contributed to the reason for death, and the age of horses that did not survive the study period was significantly older than those that did survive. TLS comment: This was a study of laminitic horses, alongside non-laminitic controls, so is unlikely to be representative of a general population. Saying Goodbye - poems, quotes and support for when you have to say goodbye. If you have a horse, you should have a euthanasia plan - make plans for your horse's last day long before you expect to need them. When? With a chronic illness or old age, it can be difficult to know when it's time to say goodbye - usually your horse will tell you. The BHS Advice on Euthanasia leaflet has guidelines to help. How? This will depend on regulations in your country, and should be discussed with your vet in advance. Sedation followed by a lethal injection of pentobarbital is a common, humane method. Where? At home, in a calm environment, avoiding stress, with absolutely no compromise of the horse's welfare. Friends. It is generally recognised that pair bonds and close friends should be allowed to see the body (see below). Body disposal. Again, this will depend on regulations in your country, and should be discussed in advance - your vet should be able to help. the right care at the end of a horse’s life is the last, and possibly greatest, thing we can do for them. Pentobarbital or a Pentobarbital Combination: This is the best choice for equine euthanasia. Because a large volume of solution must be injected, use of an intravenous catheter placed in the jugular vein will facilitate the procedure. In order to facilitate catheterization and minimize equine anxiety and stress, a tranquilizer such as acepromazine, or an alpha-2 adrenergic agonist should be administered." "If horses don't go to Heaven, then Heaven's no place for me."" We always let the other horses come see the body. They need to do this, to understand what happened. The one time we didn't the horse's mate wandered the pasture for days hunting for her, neighing for hours on end. Let them know what happened. Horses understand more than we give them credit for. They need that few minutes with the body." Euthanasia leaflet and how to contact a BHS "Friend at the End" welfare officer who will help and support you through making this difficult decision. We recommend allowing companion horses to see the body. When we lost Homer to colic, Dan, his companion of 11 years, was nearby (but behind a fence) as we fought to save Homer, and watched as his friend peacefully slipped away. Straight afterwards we let Dan in, he sniffed at Homer's body, then just once put his foreleg on Homer's quarters and gave him a little shake, as if to say "come on mate, time to get up", then he just stood quietly with us for about half an hour, before going back to graze with Chantelle. Chantelle, who hadn't known Homer as long and wasn't his pair bond, didn't come to see his body, as far as we know. Dan was deeply affected by Homer's death, we grieved together for months. We feel it is very important to give the remaining horses, especially a pair bond, as much time as they need to come to terms with losing their friend. Dr Nicholas Frank in the University of Minnesota webinar EMS and Ponies said that exercise increases the rate of weigh loss and improves insulin sensitivity. The horse must be sound with no active laminitis and the work should be increased gradually. He suggested a minimum of 30 minutes in trot and canter (plus time to warm up and cool down) 4 to 7 times a week. Long-term low intensity (10 minutes of walking and 5 minutes of trotting) exercise has an anti-inflammatory effect. "CONCLUSIONS AND CLINICAL RELEVANCE: Results suggested that moderate exercise training without concurrent dietary restriction does not mitigate insulin resistance in overweight or obese horses. A more pronounced reduction in adiposity or higher volume or intensity of exercise may be necessary for improvement in insulin sensitivity in such horses." "CONCLUSIONS:Short-term training resulted in increases in whole body insulin sensitivity, and GLUT-4 protein content and glycogen synthase activity in skeletal muscle. The enhancements in insulin sensitivity, GLUT-4 protein and glycogen synthase activity were still evident after 5 days of inactivity. POTENTIAL RELEVANCE:Insulin resistance in equids has been associated with obesity and predisposition to laminitis. Regular physical activity may mitigate risk of these conditions via enhancement of insulin sensitivity and/or control of bodyweight." Obese insulin-resistant mares worked at a trot to a heart rate of not more than 140 bpm for 30 minutes in a round pen had higher glucose infusion rates after 7 days of light exercise. "The results of this study suggest that improvement in insulin sensitivity occurs in obese mares without a long interval of exercise training and in the absence of a change in bodyweight." Horses in pain from laminitis should not be forced to walk. Horses taking any form of pain relief (NSAIDs) should be kept confined and discouraged from moving. Movement will increase circulation, and circulation is important for healing, but movement before the feet are correctly aligned and stable can cause (further) damage and rotation/sinking. When a horse has significant laminar separation, as shown by the full length gas line on this x-ray, it would be advisable to wait until the gas line has grown out and new laminar connections grown down from the coronet before starting formal exercise. Once the feet are realigned and correctly balanced, i.e. 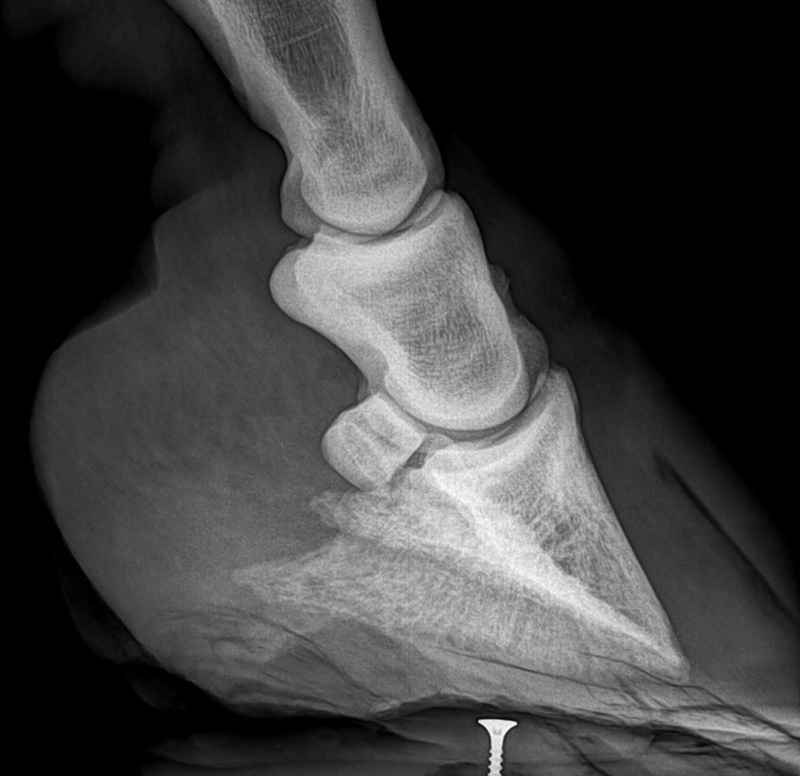 the palmar angle is correct (usually around 3 - 5 degrees) and breakover is in the correct place, the horse has been off NSAIDs/pain relief for at least 48 hours and is comfortable, the cause of the laminitis has been removed/treated and there is no further active laminitis, most horses can be allowed increased free choice movement in a small, safe enclosed area with the feet fully supported and protected as necessary, e.g. with boots and thick pads, and/or on a supportive, conforming surface e.g. sand, pea gravel, mud. At The Laminitis Site, rehabilitating horses start in a large deep-bedded shelter. As they become more comfortable they are encouraged to move around by putting hay, feed and water in different areas of the shelter. Their area is expanded slowly, a couple of meters at a time, along a grass-free strip of mud. Boots and pads will normally be worn, unless the ground is soft, and at all times if the sole is thin. They are encouraged to move up and down the strip by putting hay, feed and water at either end. When they are moving freely around their strip, they will start walking in-hand around a large flat field, in straight lines as much as possible, with large curves around the corners, starting with no more than 5 minutes and building up slowly lap by lap, with several short sessions a day. This will increase until they are walking for 30 - 60 minutes a day in two or more sessions. Then an element of training may come into the exercise programme, depending on the horse's needs, so perhaps some short in-hand sessions in the sand school, walking around other fields with slight slopes, starting to walk on roads and tracks, and long-reining - all unmounted and avoiding tight turns and circles. Ride and lead - leading the rehabilitating horse - can be done if you have a safe and sensible horse to ride. We like to have horses comfortably trotting for short periods in hand/on long-reins before introducing a rider - remember that the weight of a rider will increase the pressure on the feet. The horse will be ridden for short, increasing periods following the same pattern as the in-hand work, so straight lines as much as possible, on good ground. When the horse is comfortably being ridden in walk for an hour or so, short periods of trot can usually be introduced and again slowly built up, and circles, turns and school shapes slowly re-introduced. We try to avoid lunging for some time as this puts pressure on the inside feet and legs. We also delay canter until the horse is working well in trot, and ideally has grown a whole new hoof capsule since the laminitis, as canter puts all the horse's weight on one leg. Avoid jumping, high speed work and sharp turns for as long as possible. See Herbie's Diary for full details of her rehabilitation. Horses should get better, not worse, with exercise - any muscle stiffness should reduce, they should be be happy to take longer strides, have a relaxed carriage, show no signs of pain or distress. Stop immediately if the horse starts to show signs of pain or distress, starts to stumble or show signs of being tired, or is reluctant to move forwards. Try to work out why this has happened - ensure foot support and protection is correct, reassess the trim, ensure there is no active laminitis and management is tight. Be prepared to go back a few steps in your exercise programme. Checking that the horse is happy to move freely when loose can indicate the difference between "can't" move and "won't" move! Exercise is likely to increase both the boundingness and rate of the digital pulse, and may increase heat in the feet. Checking the heart rate by taking the mandible pulse can help identify a "normal" reaction to exercise if both digital and mandible pulse increase pretty much in line. More details about when and how to return a horse to work after laminitis, including feeding the insulin resistant horse for work, can be found in Dr Eleanor Kellon's online course Cushing's and Insulin Resistance, which runs several times/year. When the horse walks or trots comfortably in padded boots. 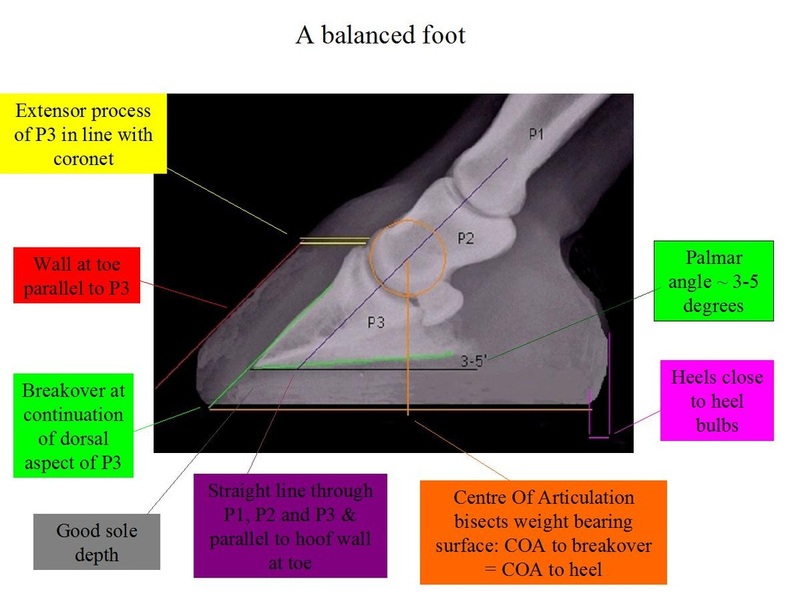 When the proximal half (new growth) of the hoof wall becomes well connected as indicated by physical and radiographic appearance of the hoof. When the sole thickness exceeds 8mm (as indicated by radiograph). If the booted horse moves comfortably and all feet impact heel first with the added weight of the rider." Don't forget horses that have been on box rest and/or weight loss diets are likely to need a change in their diet to meet their increased energy, protein and mineral needs when they return to work. See Feeding recovered laminitics when back in work - Dr Eleanor Kellon.